Sound artist and product designer. Released music tracks with Dutch techno label, X-trax, in 1997. Established Kyouei Design in 2006. Okamoto goes beyond the borders of art, design, and music with playful works loved globally. Recently, he is creating a three-dimensional piece using daily necessities and mechanical objects to reproduce elements that cannot be captured by the naked eye, such as sound, light, and gravity. In 2011,”Glass Tank” was selected for the permanent collection at the Museum of Modern Art, San Francisco (MoMA). In 2012 and 2014, he held an exhibition and a live performance at the Victoria & Albert Museum, as part of the London Design Festival curated by NPO Hexaproject. 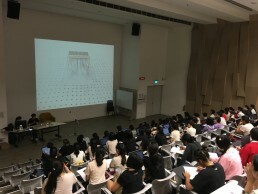 NPO Hexaproject (Non-profit Organization) is holding a talk and a workshop with the contemporary product designer who utilizes the Japanese traditional technic at SOTA (School of the Arts) in Singapore on 6th & 7th April 2016. This programme is themed “Connect Japanese culture with ‘Now’ “, and is structured to suggest a hint for creating new things but still following a good old Japanese tradition. Mainly as activities aimed at people overseas. We first started the project at V&A, London in 2011, since then we have been working with craftsmen, artists and designers who carry on traditional technic to express at the present day such as Ukiyo-e (Edo period), Hariko (Papier-mache), ceramic, Japanese lacquer and dyeing. A new attempt to introduce the fusion of traditional crafts and contemporary design, the fusion of art and design. This workshop is designed to learn, experience the advanced design and sensibility. Target : Designers or students who are fascinated by the traditional crafts, and want to make use of their own idea and design to work. Kouichi Okamoto have become synonymous as fusion artists who can freely cross the boundary between design and art. While he has worked in product design creating functional objects, he has been involved in music and sound projects and his practices have started leaning towards the pursuit of creative expression in the field of art. 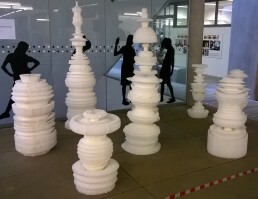 Bridging the gap between the two distinct domains, their work has been displayed in a number of institutions. Okamoto has exhibited at the V&A London as part of London Design Week 2012 and 2014. In this special talk, Okamoto will discuss the reason behind their move beyond the design parameters of utilitarian products, reflecting on his own experiences within the creative industry. 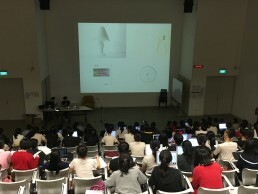 He will also expand on the differences in practice, approach and mindset between design and art, and how this unique aspect of visual arts integration will evolve in the future. With a vision to shape and impact society through an education in the arts, SOTA aims to identify and groom future generations of artists,creative professionals to be leaders in all fields, and to be patrons and supporters of the arts.